Those who oppose Modi often follow elections in India with great interest, and maybe even talk or write about them, but do little beyond. 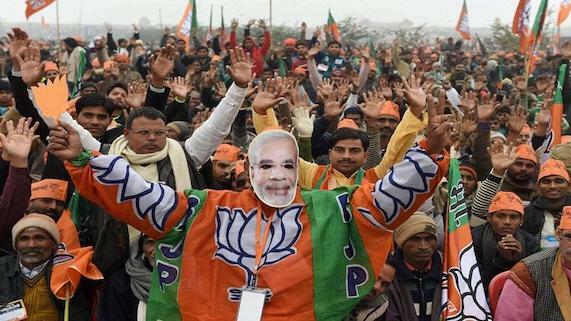 Those who support Modi organize rallies, training camps, and campaign events — in America. While one side alleges that Modi staged a pogrom, thousands of volunteers from the other side return to India to physically canvass for his political party. Eight months later, in December, a BJP-organized crowd of 150,000 tore down a mosque in India. Their fervor was stoked by speeches from BJP elected officials and even the party president, who demanded that the government build a Hindu temple there instead. Razing the mosque provoked nationwide riots in which an estimated 2,000 Muslims were killed. In response, the opposition-controlled central government temporarily banned the Rashtriya Swayamsevak Sangh (RSS), a paramilitary involved in the violence. The BJP, which was created by the RSS in 1980, responded to the scandal by establishing a strong international presence of trained party activists. Internationally, the OFBJP eventually expanded to nearly 40 chapters. In America, their membership is largely composed of U.S. citizens. Anugula says that thousands of Indian-American operatives will travel to India to work until the phased elections end. Terming himself a “chowkidar” (watchman), Modi declared in March, “Your chowkidar is standing firm and serving the nation.” He called on everyone working for India to say “Main Bhi Chowkidar” (I am a watchman). Obediently answering Modi, activists attending Chai pe Charcha events began publicly pledging to work for his re-election. Thus, the OFBJP’s operational approach seems to follow this model. Embrace the political party line. Emigrate. Take up U.S. citizenship, which requires renouncing Indian citizenship. Spread the mother country’s party line to project a “positive” image in the adopted homeland. Cultivate diaspora interest in the party. Return to India — as U.S. citizens — to campaign for that party and instruct Indian citizens who to vote for. Thus, every election season, the BJP harnesses the help of people who are dedicated to keeping the BJP in power in India despite having abandoned life in India themselves. * Pieter Friedrich is a South Asian Affairs Analyst who resides in California. He is the co-author of Captivating the Simple-Hearted: A Struggle for Human Dignity in the Indian Subcontinent. Discover more by him at pieterfriedrich.net.